Our Sun Plus holiday to Giardini Naxos is in one of the most picturesque resorts in Sicily. Our 4* beachfront hotel is the perfect base to flavour the sights and sounds of this stunning Italian island with mix of relaxation. 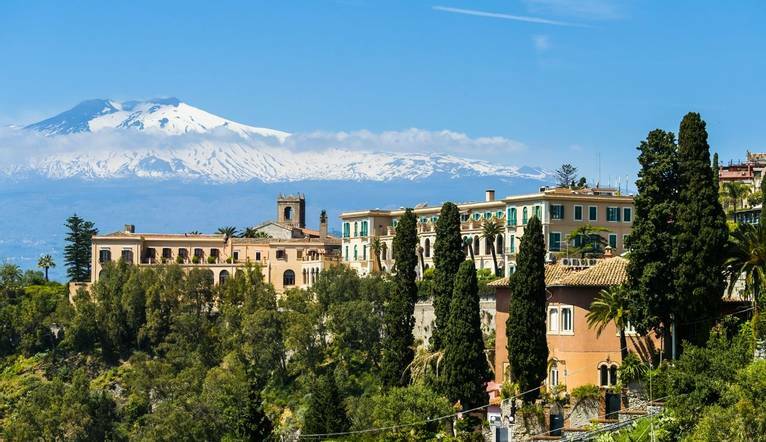 With three extraordinary included excursions, we will experience the delights of stylish Taormina as well as Mount Etna. Our first excursion is to the stylish resort of Taormina for a taste of Sicilian dolce vita. We will take a local bus to the resort where our guide will show us round its highlights, including its beautiful Greek Theatre which dates back to the 3rd Century BC. We then head for a stroll along beautiful Corso Umberto the main street in Taormina which is lined with shops, restaurants and cafes. The mountain of the mountains! Etna is the highest active volcano in Europe and we take a spectacular journey to it through dramatic mountain landscapes. At 1900 meters we’ll get out and have a walk around the extraordinary Silvestri Craters. On our way back we will visit a beekeeper to learn about and try the delicious Etna honey. Our second excursion is to the ancient city of Syracuse - home to many Greek Gods. We will take a stroll through the city to admire its ancient medieval streets and classic churches. At the archaeological park we can wonder at the remarkable Greek and Roman ruins, as well as the famous “Ear of Dionysis” . This 20m-high, slender pointed arch is cut into the rock face with a startling resemblance to a human ear! Facilities at our hotel include 4 restaurants, 4 bars (one pool bar), swimming pool, fitness centre, private beach and Free Wifi in public area. We are based in the Villa section of the hotel. The rooms are tastefully decorated and include air-conditioning, satellite TV, hairdryer, safe, mini fridge and private balcony or terrace. Transfer time from Catania airport to Ata hotels Naxos Beach Resort Ville is approximately 45 minutes. Please note this hotel uses a in-house payment card system. Clients will be given a cash card at check in, and can be topped up with money. The card is used to purchase extras at the hotel. Any monies left on the card at departure will be refunded back. You may wish to take an optional excursion during the course of your stay. Full details will be given at the Information Meeting. All tours can be paid for in Euros. Your Tour Leader will help arrange these for you but may not necessarily accompany you.